Grace Kunkel competes in the long jump at the Salem Invitational. Salem runners John Myslinski and Tristan Aldridge break from the starting line of the 800 meters with contestants from other schools at the Salem Invitational. 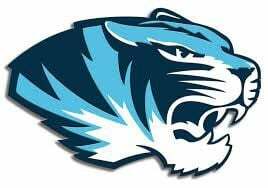 Dominating the field events, the host Salem High School boys’ track team finished first while the Lady Tigers were runner-up in the nine-school Salem Invitational, held Tuesday, April 9 at the Salem High track. In the boys’ division the Tigers rolled up 203 points to win the while Willow Springs was second with 169 and Licking third with 88. Salem won seven events in the boys’ competition, including a sweep in the throwing events. Winning their respective events for the Tigers were Sam Ball in both the shot put at 43-5 ½ and the javelin at 146-0; Bryan Marlin in both the 200-meter dash at :23.81 and the 400-meter dash at :54.90; Nathan Pyle in the discus at 110-5; Konner Ousley in the long jump at 18-10, and the 4x800-meter relay team of Tristen Aldridge, John Myslinski, Isaac Koontz and Matthew Walther at 9:37.03. Salem second places were by Aldridge in the 400-meter dash at :57.01; Brandon White in the discus at 106-0; Jake Barton in the long jump at 18-8; the 4x200-meter relay team of Caden Camden, Levi Skaggs, Ousley and Tristan Newman at 1:37.48, and the 4x400-meter relay team of Marlin, Tristen Aldridge, Camden and Myslinski at 3:43.03. Tiger third places were by Myslinski in the 800-meter run at 2:15.53; Koontz in the 3,200-meter run at 12:29.79; Pyle in the shot put at 40-5; J. Barton in the pole vault at 11-6; Newman in the triple jump at 34-10 ½, and the 4x100-meter relay team of Camden, Skaggs, Ball and Ousley at :47.47. In the girls’ division Willow Springs won the team title with 193 points while Salem was second with 148.5 and Licking third with 98. Lady Tiger first places were by Autumn Manthey in the discus at 99-5; Miranda Raulston in the javelin at 105-4, and Kirsten Golden in the pole vault at 8-6. Salem second places were by Autumn Manthey in the shot put at 32-9 ½; Denise Stoner in the 1,600-meter run at 6:11.63; the 4x100-meter relay team of Shelby Botkin, Golden, Melody Whitman and Isabella Jadwin at :54.71, and the 4x800-meter relay team of Andrea Bray, Desirae Scott, Brooke Scott and Allison Manthey at 12:56.08. Lady Tiger third places came from Botkin in the 100-meter dash at :13.71; Stoner in the 3,200-meter run at 14:27.77; Clowy Kunkel in the pole vault at 8-0, and the 4x400-meter relay team of Whitman, Golden, Jodi Gotchal and Allison Manthey at 5:00.90. 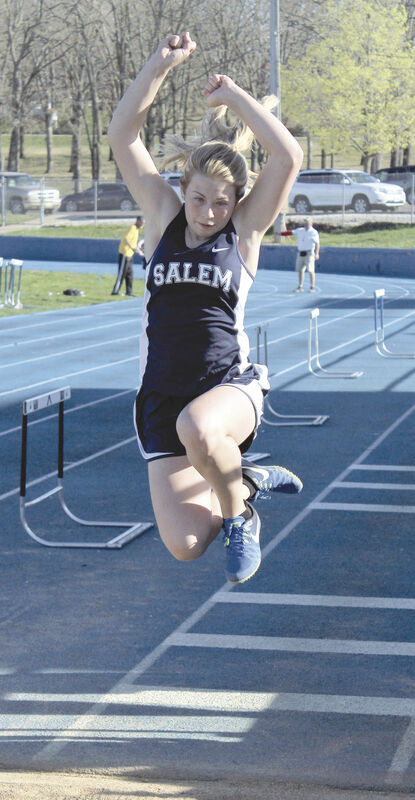 Also last week Salem competed in the 15-school West Plains Relays Thursday, April 11. In the boys’ team standings host West Plains won with 173 points while Waynesville was second with 159.5 and Rolla third with 131. Salem placed seventh with 34 points. Kolson Seay had the Salem boys’ top finish, placing second in the shot put at 44-8 while White was fourth in the javelin at 136-0. In the girls’ division West Plains won the team standings with 164.5 points while Waynesville was second with 153 and Willow Springs third with 106. Salem placed eighth with 32 points. The Lady Tigers got an event victory from Autumn Manthey, who captured the discus with a throw of 105-3. Also for the Salem girls, Raulston was second in the javelin at 97-1 while finishing third were Autumn Manthey in the shot put at 30-9 ¼ and the 4x800-meter relay team of Bray, D. Scott, B. Scott and Allison Manthey at 12:44.67. This week Salem is slated to compete in the Ava Invitational Thursday, starting at 4 p.m. Team Standings: 1. Salem 203, 2. Willow Springs 169, 3. Licking 88, 4. Mountain Grove 66, 5. Houston 61, 6. Mountain View Liberty 55, 7. Cuba 39, 8. Arcadia Valley 21, 9. Cabool 19. 100-meter dash: 5. Levi Skaggs :11.87, 6. Konner Ousley :11.93. 200-meter dash: 1. Bryan Marlin :23.81; 4. Skaggs :24.66. 400-meter dash: 1. Marlin :54.90; 2. Tristen Aldridge :57.01. 800-meter run: 3. John Myslinski 2:15.53; 6. Aldridge 2:22.92. 1,600-meter run: 5. Myslinski 5:09.19; 12. Marcus Brooks 5:46.35. 3,200-meter run: 3. Isaac Koontz 12:29.79. 110-meter hurdles: 4. Ethan Wilson-Webber :18.62; 5. Chase Graham :19.21. 300-meter hurdles: 5. Dawson Mock :46.52; 6. Tristan Newman :46.53. 4x100-meter relay: 3. Salem (Caden Camden, Skaggs, Sam Ball, Ousley), :47.47. 4x200-meter relay: 2. Camden, Skaggs, Ousley, Newman), 1:37.48. 4x400-meter relay: 2. Salem (Marlin, Aldridge, Camden, Myslinski), 3:43.03. 4x800-meter relay: 1. Salem (Aldridge, Myslinski, Koontz, Matthew Walther), 9:37.03. Shot put: 1. Ball 43-5 ½; 3. Nathan Pyle 40-5. Discus: 1. Pyle 110-5; 2. Brandon White 106-0. Javelin: 1. Ball 146-0; 5. White 119-0. High jump: 4. Jake Barton 5-6; 5. Newman 5-2. Pole vault: 3. J. Barton 11-6; 4. Camden 11-6. Long jump: 1. Ousley 18-10; 2. J. Barton 18-8. Triple jump: 3. Newman 34-10 ½; 5. Colton Lerma 32-11. Team Standings: 1. Willow Springs 193, 2. Salem 148.5, 3. Licking 98, 4. Cuba 95, 5. Arcadia Valley 54, 6. Liberty 52, 7. Mountain Grove 35, 8. Cabool 18.5, 9. Houston 7. 100-meter dash: 3. Shelby Botkin :13.71; 6. Isabella Jadwin :13.74. 200-meter dash: 6. Botkin :29.02; 10. Madison Woolf :30.01. 400-meter dash: 6. Melody Whitman 1:13.57; 7. Woolf 1:13.90. 800-meter run: 4. Denise Stoner 2:57.57; 5. Allison Manthey 3:06.26. 1,600-meter run: 2. Stoner 6:11.63. 3,200-meter run: 3. Stoner 14:27.77. 100-meter hurdles: 4. Jodi Gotchal :19.27; 7. Alaina Ferguson :20.88. 300-meter hurdles: 5. Desirae Scott :58.80. 4x100-meter relay: 2. Salem (Botkin, Kirsten Golden, Whitman, Jadwin), :54.71. 4x200-meter relay: 4. Salem (Botkin, Clowy Kunkel, Whitman, Ferguson), 1:59.95. 4x400-meter relay: 3. Salem (Whitman, Golden, Gothal, Allison Manthey), 5:00.90. 4x800-meter relay: 2. Salem (Andrea Bray, D. Scott, Brooke Scott, Allison Manthey), 12:56.08. Shot put: 2. Autumn Manthey 32-9 ½; 5. Ashton Mink 30-0 ¾.
Discus: 1. Autumn Manthey 99-5; 7. Mink 69-6. Javelin: 1. Miranda Raulston 105-4; 4. Autumn Manthey 83-2. High jump: 5. Woolf 4-4; 6. Gotchal 4-4. Pole vault: 1. Golden 8-6; 3. Kunkel 8-0. Long jump: 5. Kunkel 13-1; 10. Raulston 11-11. Triple jump: 6. Raulston 25-9 ½; 7. Gotchal 25-9. Team Standings: 1. West Plains 173, 2. Waynesville 159.5, 3. Rolla 131, 4. Mountain Home, Ark. 65, 5. Ava 61, 6. Springfield Hillcrest 36, 7. Salem 34, 8. Willow Springs 31.5, 9. Licking 30, 10. Mountain Grove 27, 11. Alton 13, 12. Dora 6, 13. Gainesville 5, 14. Bakersfield 3, 14. Mtn. View Liberty 3. High jump: 8. Jake Barton 5-6. Pole vault: 8. J. Barton 11-0; 10. Caden Camden 10-6. Long jump: 5. J. Barton 18-11 ½; 9. Konner Ousley 18-2 ½; 26. Taytan Barton 15-6 ½. Triple jump: 9. Tristan Newman 37-4 ½; 18. Colton Lerma 33-6; 19. Ethan Wilson-Webber 33-2 ¾.
Discus: 5. Brandon White 120-3; 6. Nathan Pyle 120-0; 7. Kolson Seay 107-9. Shot put: 2. Seay 44-8; 6. Pyle 39-3. Javelin: 4. White 136-0; 5. Sam Ball 135-10; 25. Seay 72-0. 110-meter hurdles: 14. Ethan Wilson-Webber :20.13. 100-meter dash: 14. Levi Skaggs :12.33; 20. Ousley :12.47. 1,600-meter run: 25. Marcus Brooks 5:43.72. 800-meter run: 18. Tristen Aldridge 2:26.68. Team Standings: 1. West Plains 164.5, 2. Waynesville 153, 3. Willow Springs 106, 4. Rolla 77, 5. Licking 51, 6. Ava 36, 7. Mtn. View Liberty 35, 8. Salem 32, 9. Mountain Home 31.5, 10. Hillcrest 25, 11. Mountain Grove 16, 12. Bakersfield 15, 13. Gainesville 8, 14. Alton 3. High jump: 13. Madison Woolf 4-4; 15. Jodi Gotchal 4-2. Pole vault: 7. Grace Kunkel 7-0. Long jump: 15. Kunkel 12-7; 17. Miranda Raulston 12-0; 21. Alaina Ferguson 11-1. Triple jump: 14. Raulston 27-1; 15. Gotchal 26-11; 16. Raylynn Nicholson 24-2. Discus: 1. Autumn Manthey 105-3; 29. Carlie Fleener 52-8. Shot put: 3. Manthey 30-9 ¼; 20. Fleener 24-10 ¼.
Javelin: 2. Raulston 97-1; 11. Manthey 72-11. 4x800-meter relay: 3. Salem (Andrea Bray, Desirae Scott, Brooke Scott, Allison Manthey), 12:44.67. 100-meter hurdles: 12. Gotchal :19.72; 16. Ferguson :21.95. 100-meter dash: 14. Isabella Jadwin :14.40; 18. Shelby Botkin :14.48. 1,600-meter run: 9. Denise Stoner 6:09.89.